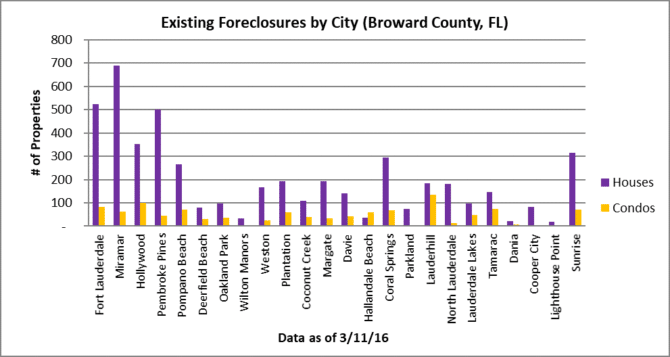 It has been awhile since we have provided a foreclosure update with a city by city count of properties. Today we will run through Broward County. Our first chart shows how each city stacks up. 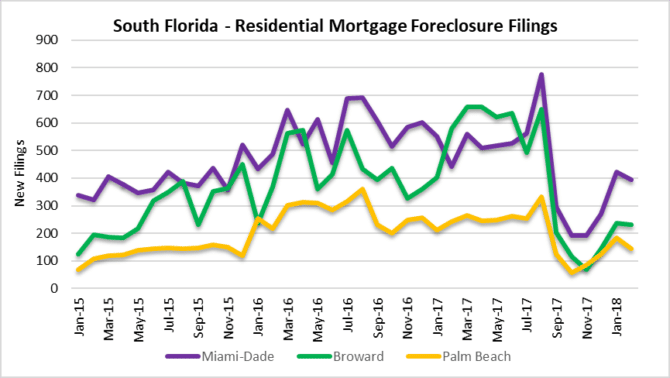 Although many of these properties will not make it to the market, there are 5,911 houses and condos in some stage of foreclosure scattered across the area. Fort Lauderdale, Miramar, Hollywood and Pompano Beach lead the list. 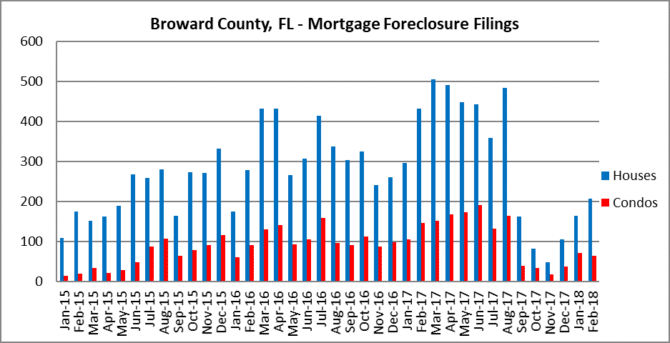 The pace of new mortgage foreclosure filings took a break during the fourth quarter of 2017 due to the FEMA hold on filings. New filings have been slow to start 2018, but we expect them to move higher as we move through 2018. How does Broward County compare to Miami-Dade and Palm Beach? Take a look at this next chart. The sharp decline across the tri-county area took place in September after Hurricane Irma. We don’t know how long it will take to resume the prior pace, but stay tuned and we will continue to provide updates. This entry was posted in Foreclosure activity, Fort Lauderdale foreclosures, Shadow Inventory, South Florida Real Estate and tagged distressed property, Fort Lauderdale real estate, REO. Bookmark the permalink. Both comments and trackbacks are currently closed.